Perform, record, and create music. Rebuilt from the ground up with a fresh new look and amazing new features, GarageBand is the easiest way to create a great-sounding song on your Mac. Add realistic, impeccably produced and performed drum grooves to your song with Drummer. Easily shape the sound of any instrument in the Sound Library with Smart Controls. Crank up the bottom end with brand-new bass amps, or mix and match electric guitar amps, cabinets, and pedals with Amp Designer and Pedalboard. Control GarageBand and play any software instrument wirelessly on your iPad using the Logic Remote app. Use iCloud to keep your GarageBand projects updated across multiple Mac computers, or even import GarageBand for iOS songs directly from iCloud. • Use iCloud to keep your GarageBand projects up to date across your Mac computers. * Requires Apple Music Connect account. Adds support for OS X Yosemite. Access audio effect plug-ins for more detailed control over the sound of your tracks. Build your own bass rig with Bass Amp Designer using vintage and modern amps, cabinets, and mics. New Voice Template for fast and easy vocal recordings. Share GarageBand projects with Mail Drop. Vertical zoom automatically adjusts the height of your tracks. Contains multiple enhancements to Accessibility. Use iCloud to keep your GarageBand projects up to date across your Mac computers. Fixes an issue with the GarageBand Lesson Store not completing single or multiple lesson downloads. Corrects issues with some tempo-based effects falling out of sync with main song tempo. Resolves problems with Magic GarageBand project files not opening up correctly in the GarageBand tracks view. * Support for opening projects imported from GarageBand for iPad. This update is recommended for all GarageBand '11 users. Flex Time and Groove Matching are powerful tools that help you improve the rhythm and feel of your recordings. You can fix the timing of a note. Tighten the groove of your tracks. And easily create a great-sounding song. GarageBand brings you seven new guitar amps for a total of 12. They're modeled after the most revered gear in the world — from clean sounds to heavy distortion and everything in between. You can also reproduce the sound of classic foot pedals with five new stompbox effects, making 15 to choose from. Mix amps with stompboxes and find thousands of ways to rock. And with the Apogee GiO (sold separately), you can control GarageBand hands-free, so you don't ever have to stop playing. The GiO lets you control stompbox effects, recording, and transport controls with your feet. Plug an electric guitar into your Mac, crank it up, and let it rip. First GarageBand taught you how to play. Now it tests your chops. As you play along with any lesson, record yourself. GarageBand listens in real time and tells you how you're doing. You'll see how well you played with colored notes, a progress bar, and a performance meter. You can check your rhythm and note accuracy, keep track of your progress, and beat your best score — all while perfecting your skills. With 22 new genre-based lessons (40 in all), you can pick up the basics of piano, guitar, or even both. Video demonstrations, synchronized notation, and instrument animations make lessons fun and easy to follow. And you can learn at your own pace. You'll jam with the Blues Guitar and Rock Guitar series. You'll master classical piano pieces by Bach, Beethoven, Mozart, or Chopin. And you'll play Top 40-style piano with the Pop Piano series. The new built-in glossary is a great reference for tuning your guitar, changing strings, reading music, finding basic chords and scales, and more. With the Chord Trainer, you'll master the most important guitar chords by shape, which makes it easier to keep them straight. This update addresses general compatibility issues, improves overall stability, and fixes a number of other minor issues. This update improves overall stability and addresses specific issues with downloading lessons from the Learn to Play Lesson Store. It is recommended for all GarageBand 09 users. GarageBand '09 introduces Basic Lessons: the easiest way to learn piano and guitar, right on your Mac. Follow along at your own pace with interactive lessons that teach you the fundamentals through HD video instruction, synchronized notation, and animated onscreen instruments. Play your way through a series of nine piano or guitar lessons that get you ready to play an entire song. Learn by repetition. Slow things down or repeat any part to get it right. Basic Lessons give you complete control over how you learn. And when you're more comfortable, you can practice your new skills with a complete backing band. Sure, music video games are fun. But nothing is more authentic than learning to play a real song on a real instrument. And who better to teach you that song than the artist who made it famous? Introducing Artist Lessons in GarageBand '09 (sold separately). Have Sting teach you how to play "Roxanne," Colbie Caillat teach you how to play "Bubbly," Fall Out Boy teach you how to play "I Don't Care," and many more. 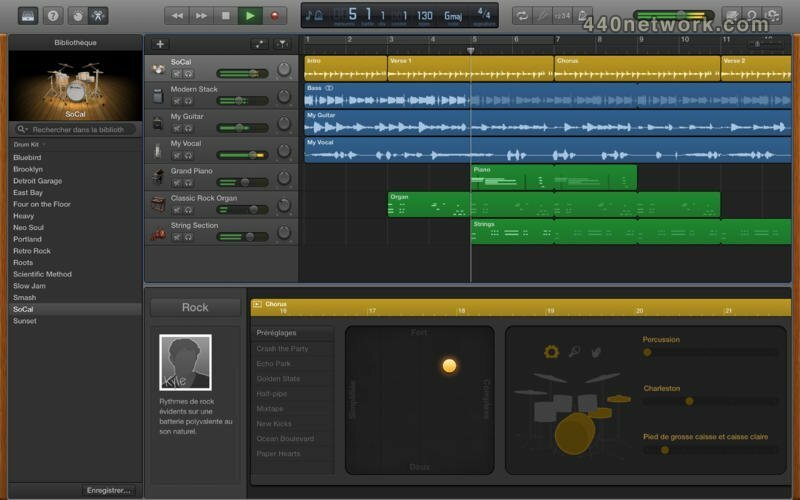 Browse, preview, and purchase Artist Lessons from the Lesson Store inside GarageBand. Then get step-by-step instructions for chords, finger positions, and techniques from the people who know your favorite songs best. Play along with your artist/instructor or take your skills to the next level and jam with the original band. You can even select and listen to individual instruments from multitrack recordings available only on GarageBand. Want to hear what Sting's guitar sounds like on its own? Think you're ready to sit in for Colbie Caillat? Artist Lessons let you control the mix and instrumentation, so you can hear or play whatever you want — even slow things down to make learning easier. Artist Lessons also give you something you won't find anywhere else: the story behind the song. Sit back and listen to each artist tell you how the song was written and what inspired it. The Artist Lessons library keeps growing, so you'll always have songs to learn (and learn about). GarageBand '09 puts rock history on display with new amps and stompbox effects that re-create the sound of legendary guitar rigs — right on your Mac. Just plug in an electric guitar and play through five new amps modeled after the most revered in the world. Choose from over 30 complete rigs, including Brit Pop, Honky Tonk, Lowdown Blues, Seattle Sound, Stadium Solo, and Woodstock Fuzz. Add virtual stompboxes that reproduce classic foot pedals, including Fuzz Machine, Blue Echo, and Auto-Funk. Then get a 3D view of your rig — complete with amp, speaker cabinet, and stompboxes. When it's time to focus on jamming, turn your Mac into a full-screen stage with Magic GarageBand Jam. Assign instruments and styles to your guitarist, bassist, drummer, and keyboard player. Shuffle instruments randomly to instantly hear a new sound from your backing band. Create a custom mix using volume sliders or by muting and soloing any instrument. Quickly navigate to any part of the song using the new Arrangement Track, or just repeat your favorite part. When you're happy with rehearsals, you can record right into Magic GarageBand. Easily create podcasts in the new Podcast Studio mode and publish them with iWeb. Add radio-style sound effects and jingles to your recordings and podcasts. Sound like a professional radio host with the built-in expertise of an audio engineer. Create a talk show podcast and interview one or more remote guests simultaneously via iChat. Create a music score for your iMovie even if you're not a musician. 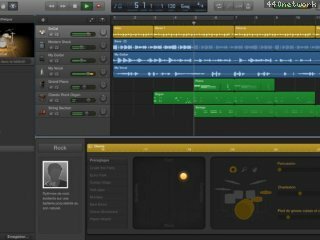 GarageBand 2.0.1 addresses issues with duplicating tracks, playhead snapping to grid, joining software instrument regions on adjacent tracks, making precise adjustments to volume and pan settings, and converting Software Instrument Apple Loops based on drum sounds into Real Instrument Apple Loops. It also addresses an issue where recorded Real Instrument regions may not properly adjust to changes in the project key. and support for more musical formats. GarageBand 1.1 addresses isolated performance and stability issues, allows per-track Echo settings similar to other effects, supports loop libraries in other disk locations, supports importing unprotected AAC audio files in addition to AIF and MP3 files, and addresses issues with ReWire support, moving GarageBand songs between different computers, Help support, fixing the timing of individual notes (as well as entire regions), and dragging entire tracks in the timeline. . Considering all the Apps that iLife comes with, Garageband only costs about $20.00 That's amazing. I've used it for almost a year with a midi keyboard/controller, using the built in fx and instuments as well as 3rd part AU's. Yeah, Garageband makes a perfect Audio Unit host. It sounds great. The loops that come with it.. well you can consider them free of charge when you think about it. It has great editing power, and high performance. 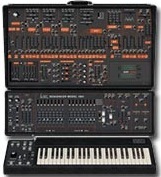 You can't tell a big difference between it and Apples $300 Logic Express as far as I can hear. For any type of music, Garageband is an VERY affordable and EASY to use Mac app that sounds GREAT! As a newcomer to digital recording, and on a very limited budget, I chose to buy a Mac mini, PreSonus TubePre, Tascam US-224, and a Audio Technica '3035. It is VERY easy to operate, and I can easily send and recieve files with my bandmate in San Francisco using "yousendit.com" He is using Protools and the two are very compatible. Fantastic at Twice The Price! I just picked this thing up as an excuse to purchase the iLife 4, and I have to say, this is one shopping cart with some serious horsepower. All the basic instruments sound pretty good, and when you toss in some of the included effects, the result is a bit amazing. And I almost fell over when I was able to activate my copy of Reaktor in it! WOW! That is like dropping a Ferrari engine in a kiddy car! And it works! Go figure. Gotta give Apple credit on this one. Could be a major upset for some much more glamorous programs. And I might add, the cheapie looking fake wood interface does not quite add up to the potential of this little program. And the loops are cliché and the sequencer seems to wobble a bit in my eMac 700, but for the price of 3 retail CD's, Garage Band is a kick in the pants. I think I will be using it just because I can. Quite a statement that something so simple can do so much. Kind of like an FL Studio for the Mac, but sort of not really. Well, kudos to Apple, Garage Band is the sleeper of the year. And at twice the price, it would still be almost reasonable. An excellent software for beginners, even usefull for professionnals as a "notepad". Worth the price! I also have a Powerbook G4 (not even a spanking new one, but the "old" 867mhz one). I have not experienced the trouble that Jonathan Williamson has. I get quick response and good sound (in headphones and also via speakers I have plugged in by way of an adaptor). I get no trouble at all with "disk is too slow" errors. I saw one once after I put a zillion tracks in though, just to test it out. The Help file (in lieu of a manual... I agree I'd rather have a dead tree but thems the breaks) mentions things you can do, like limiting voices etc. When I export to iTunes it definitely doesn't try to fire up classic... sounds like you got a whacked setup Jonathan. What prevents me from going Excellent (gotta keep in mind that it's Excellent in the $50 software arena) is the lack of MIDI import. I'm hoping Dent du Midi will solve this oversight until Apple adds it in. I like it tons. Just what the Doc ordered. There's room for improvement but it's a great little program. No MIDI import. NO manual. My new Powerbook G4 gets "disk is too slow errors playing the sample songs from Apple on the install CD.I choose "Expot to iTunes" it trys to start up OS 9 iTunes under OS X versiion of GarageBand! This app is slow and needs help. I also have Mark of the Unicorn's Digital Performer, I thought this would be easier to learn and work with - BUT - NOT SO! Un outil exceptionnel pour qui veut faire SIMPLEMENT du bon enregistrement de QUALITE. Les dernières mises à jour ont apporté des améliorations très utiles notamment en Audio... Idéal, avant d'affronter les longues séances de lecture des modes d'emplois des séquenceurs plus "pro"
Conçu comme un jeu musical à base de boucles, ce logiciel se révèle aussi un outil simplissime pour composer et enregistrer ses propres musiques. Son interface, claire et plaisante, permet au compositeur débutant ou confirmé de rester concentré sur la musique plutôt que sur le mode d'emploi. Un formidable outil d'initiation à la musique sur ordinateur. En sus le jampack4 (per ex) permet de s'initier avec plaisir au grand orchestre complet en legato ou en pizzicato. Super ! Un excellent logiciel pour démarrer, ou meme comme "bloc note" pour les plus expérimentés, au rapport qualité/prix imbattable.